A growing number of people have expressed their concern about high levels of polarization in the society. For instance, the World Economic Forum's report on global risks lists the increasing societal polarization as a threat – and others have suggested that social media might be contributing to this phenomenon. The article that received the best student-paper award in the Tenth International Conference on Web Search and Data Mining (WSDM 2017) builds algorithmic techniques to mitigate the rising polarization by connecting people with opposing views - and evaluates them on Twitter. The research models user interactions around a given topic such as US elections or Obamacare on Twitter as an endorsement graph, nodes representing the Twitter users. One commonly observed feature of such graphs is that, for controversial topics, the structure of the graph is strongly biclustered. The research suggests bridges between users of opposing sides, so as to effectively minimize the polarization. Bridges can be used to provide users with recommendations about who to retweet. "We are the first to propose a thoroughly algorithmic solution, which can be applied on a large-scale and is language- and domain-independent. The main algorithm is based on the finding that for a special type of network simulating a polarized network, the best bridges we can add to the network are between the nodes with the highest degrees on either side", explains professor Aristides Gionis from Aalto University Department of Computer Science. Since the study deals with retweet networks, high-degree users usually are the ones who are well known and have many followers. In the case of US elections, the two sides would be the democrats and republicans and the highest degree users would be Hillary Clinton and Donald Trump on either side, respectively. It is not practical to recommend that Clinton would follow Trump, so even though in theory these are the best edges, they might not materialize in the real world. 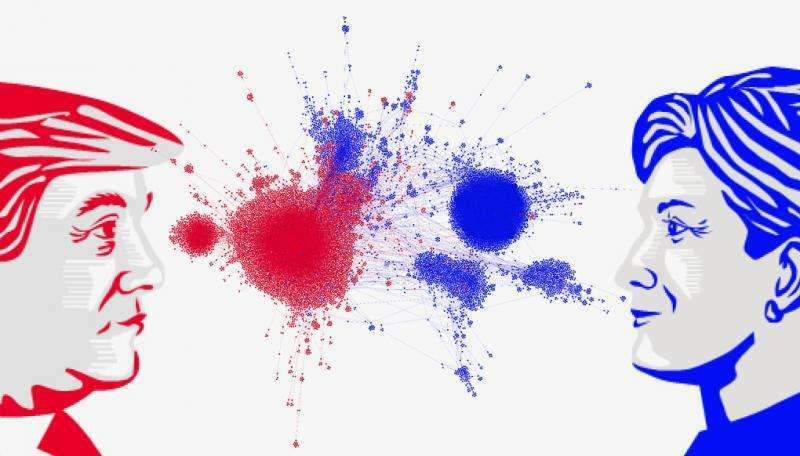 "When applied on Twitter discussions around the US election results, the algorithm suggests that creating a bridge between @hillaryclinton and @breitbartnews would reduce polarization the most. However, taking into account how likely such a bridge is to materialize, the algorithm suggests that other bridges between less prominent Twitter accounts, for instance liberal journalist @mtracey and conservative activist @rightwingangel show better potential", describes researcher Kiran Garimella. The research approach of Kiran Garimella, Gianmarco De Francisci Morales, Aristides Gionis and Michael Mathioudakis performs better than existing ones, in terms of bringing the two sides closer. Though earlier studies have tried to address the problem of how to recommend content to an ideologically opposite side, researchers of Aalto University, Helsinki Institute for Information Technology HIIT and Qatar Computing Research Institute intend to move from who to what to recommend in their future studies. They have gone as far overboard as they can about even the vary smallest of things. For example they want a full investigation about the color tie he wears.